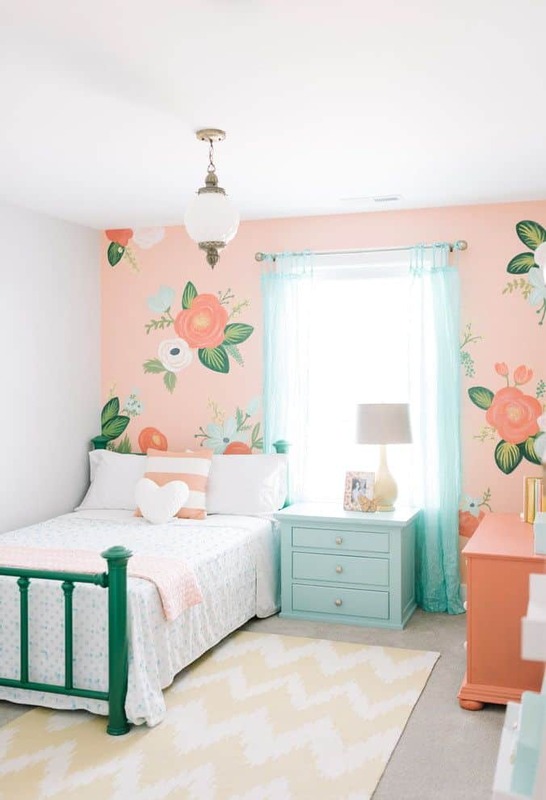 The pre-teen years for young girls can be tough–that’s why we love the bright and happy positive vibes of this bedroom. 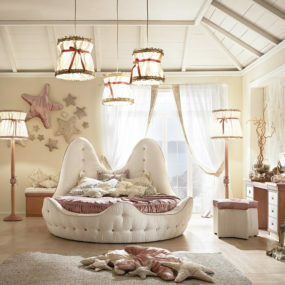 Sea foam blue, peachy tones, white, and green create the perfect summery palette for a young girl. With a lot of colour and prints going on, keep things balanced and simple by focusing a busy wallpaper on only one wall, leaving the remaining walls a crisp white. For a contemporary girl, a swirly colourful rug reminiscent of the ’90’s and modern minimalistic furniture make a great combination. While the crisp charcoal window frames give this room a more forward adult look, the coloured glass chandeliers adds a gentle punch of youth back into the space. Install an elegant canopy with a creamy fabric and gentle line of roses to make her feel like the princess she is. We love that this designer has opted for a pale shade of pink rather than bubble gum or hot pink for an effect that’s sweet but not overdone. Offset your typical pink with a strong and bold colour like navy blue. 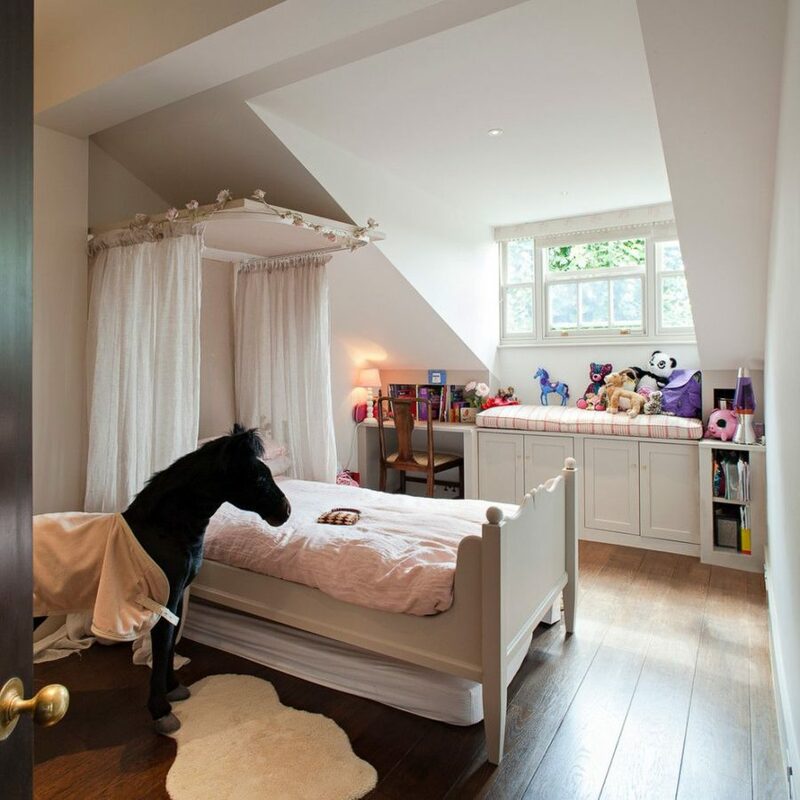 This space was inspired by and reflects a young girl’s sweet and energetic personality. We also love how the designer makes multiple fun patterns such as a striped blanket, a tree printed wall paper, graphic lamp shades, swirling rose pillow and white bubble drawers work well together by keeping colours unified. For the modern fashion forward teen girl, she’ll feel like the ultimate fashionista with mature shades of beige and cream complimented by fierce accents like hot pink and orange. Incorporate elegant pieces like a white plush foot stool, soft curtains, and a mirrored dresser. 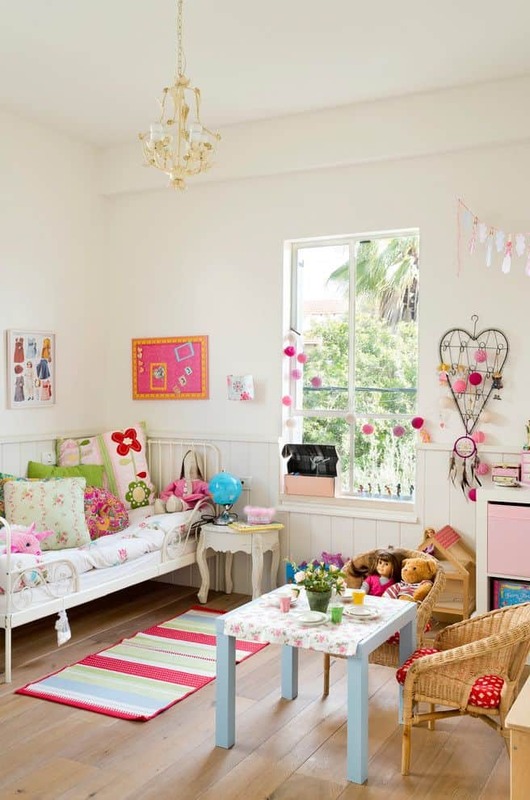 For a cottage chic toddler room, match floral textiles, wood flooring, and cute trinkets around an old window sill. 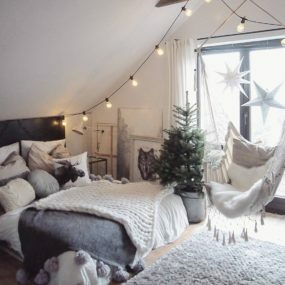 DIY craft projects are also great design ideas for this style–like a homemade dream catcher and 3D paper balls strung around the window. Create the ultimate doll playhouse by building one over and around the bed. Go all out with a ruffled bed skirt and layered curtains. Stuffed animal friends are important to young kids so make sure there’s a special spot for every one of her fury friends by incorporating a display shelf into the room as well! 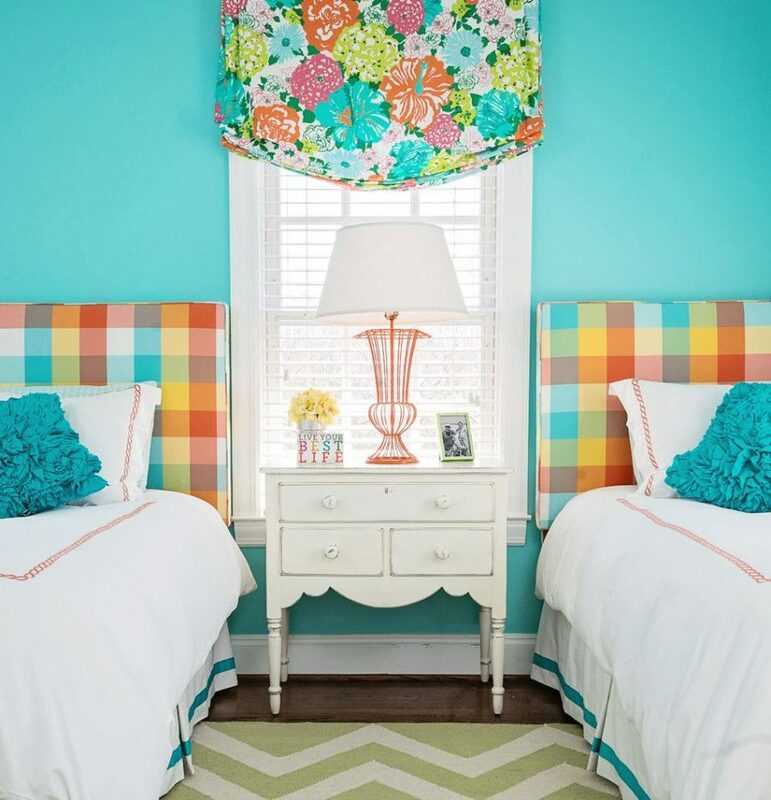 Scrap the pinks and purples and go bright with bold summery teal walls, crisp white, yellow, and orange. Notice how multiple patterns including checkers, chevron, and floral are present in the space but don’t overwhelm each other. 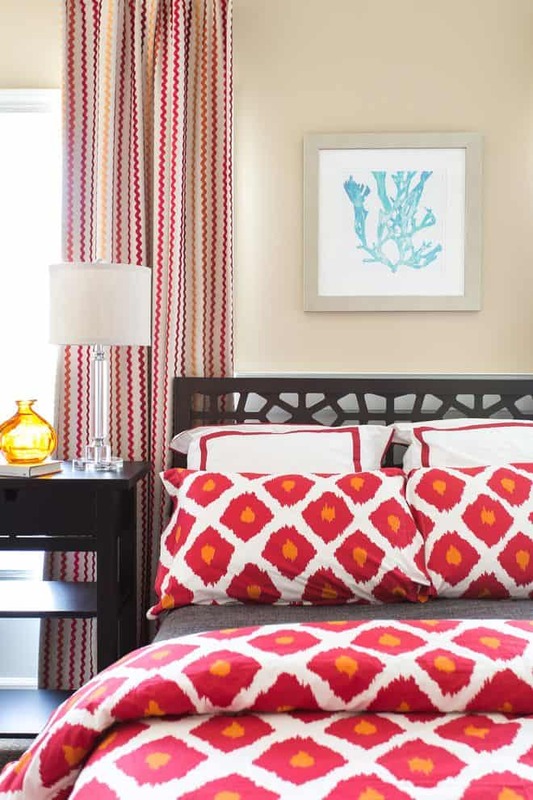 Accomplish this by ensuring there’s lots of solid space between each pattern such as a solid coloured wall that breaks between the checkered headboards and floral wall piece. Some teens insist on dark and moody colour schemes reflective of this precarious period of their lives. 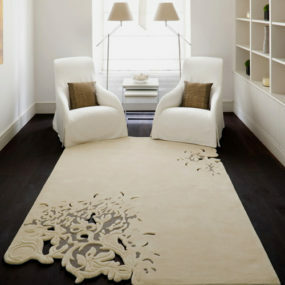 Embrace it by steering them towards a chicer look by combining dark tones with some primary brights and crisp white. 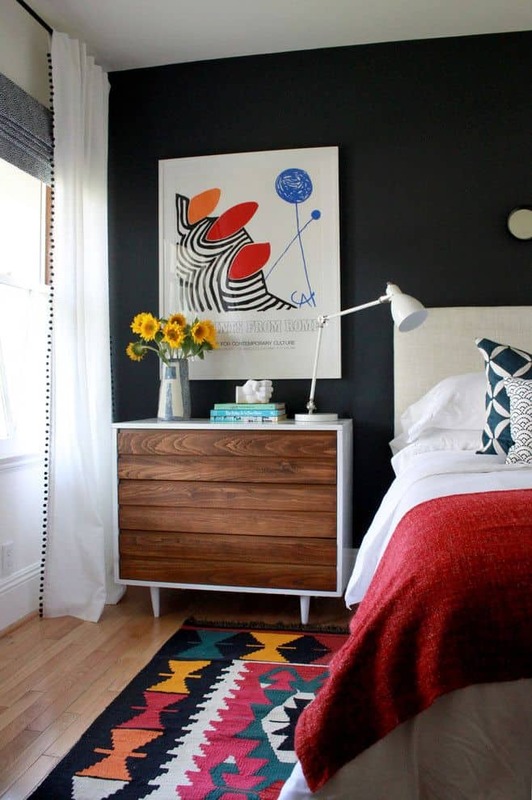 Black walls can work for both you and your teen if you’ve got a well lit room and lighter accents like cheerful sunflowers and eye catching wall art. 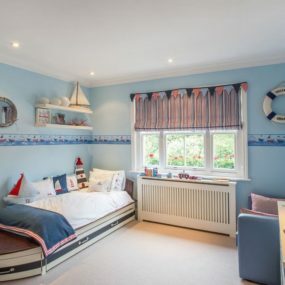 Here’s another take on the fashion forward bedroom for a young girl. Staple pieces for a fashion inspired room include a mannequin bodice for styling outfits and a bulletin board for her to pin up ideas and drawings. Create a space where she can work, create, and feel inspired. For a girl who’s outgrown dolls and pink decor, this bedroom design is a great model for a more sophisticated look but still remains vibrant. Pick one element of the room like the bedding here to be the centre of attention and base the rest of your decor around this. Darker furniture, neutral walls, and elegant accents like glass vases and lamps add an appropriate amount of elegant maturity, but the bed and curtains still keep it youthful and fun.